Were you one of the many people who asked me for my Taco Mac and Cheese recipe the last couple times I posted the meal in my What’s For Dinner menu? Well you’re in luck. I’m guest posting over at The Gaines Gang (you remember Kate who shared her awesome Potato Casserole Recipe). 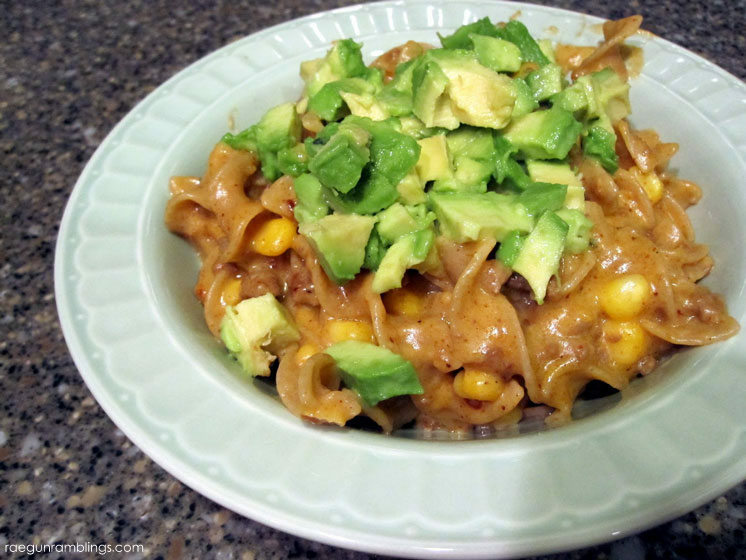 So hop on over there to learn how to make my taco mac and cheese, it’s oh so easy and yummy. If you’re visiting from The Gaines Gangwelcome. I hope you stay and peek around. If this is your first time here let me point you to a few of my favorite posts. Add back in meat and cheese. Taste it, if it needs more flavor add more taco seasoning and/or salt. Take 1/4 cup pasta water and stir in. Drain pasta and corn and reserve some pasta water. Add pasta to the sauce, if it’s to thick add some of the pasta water, if it’s too thin just stir and cook a little longer until it thickens. Right before serving top with avocado. This makes 2 hearty adult servings. This can be easily multiplied for more people. That looks like dinner – off to see the recipe!